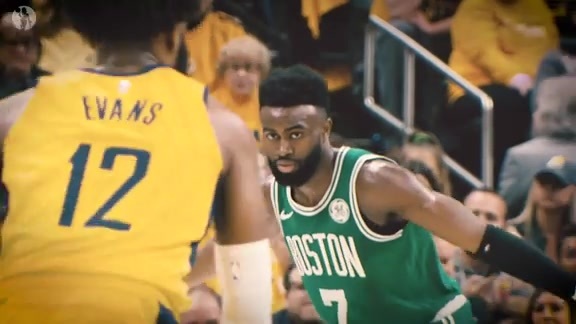 An NBA version of hot-potato took place during the fourth quarter of Monday’s matchup between the Celtics and the Nuggets. Unfortunately for Boston, it lost. For a good minute-plus, beginning just ahead of the five-minute mark, the basketball seemed to bounce around with no real intent or purpose for either team. Loose balls. Strange shot selections. Ugly turnovers. That was the name of the game, at least until Gary Harris connected on a dagger of a 3 from the right corner with 4:01 remaining on the clock. Prior to that 3-pointer, neither team scored during the previous minute and 12 seconds of playing time. During that time frame, the teams combined to shoot 0-for-6 from the field while committing two turnovers. Again, that was all within 72 seconds of action. Then the Nuggets finally corralled the ball, and they put the game away. Leading by seven, Denver hauled in a defensive rebound after Boston misfired on three straight shots on a single possession. Nikola Jokic grabbed the board, took the ball out in transition, hit Paul Millsap on the right wing, and then Millsap skipped one more pass to Harris, who was in front of Boston’s bench. Morris caught and fired on a rather uncontested 3 that put the game away. Denver’s lead would remain at five points or more the rest of the night as it held on for a 114-105 victory. That stretch of hot potato, during which the C’s couldn’t catch a break and which ended in that dagger of a trey, is what prevented a Boston comeback. Three games, three 30-point efforts. That’s the story of Kyrie Irving since March 14. Irving rattled off another 30-point performance Monday night while the Celtics hosted the visiting Nuggets. The All-Star point guard dropped in a game-high 30 points on 10-for-23 shooting. He was also a perfect 8-for-8 from the free-throw line. No other player in the game scored more than 21 points during the contest. Irving single-handedly outscored Boston’s bench 30-24. This was the third straight contest during which Irving notched at least 30 points. He tallied a triple-double March 14 that consisted of 31 points, 12 assists and 10 rebounds. Irving then totaled 30 points, 11 rebounds and nine assists Saturday afternoon against Atlanta. He continued the spurt with Monday night’s scoring effort. In addition to his 30 points, Irving also contributed five rebounds, four assists, four steals and a blocked shot. He accrued all of these statistics in slightly more than 36 minutes of action. Both teams scored 15 second-chance points. Kyrie Irving led the game in both scoring (30 points) and steals (four). Nikola Jokic grabbed a game-high 13 rebounds to go along with team highs of 21 points and seven assists. Five different Celtics blocked a shot. Al Horford tallied 20 points and six rebounds. All five of Boston's starters played at least 33 minutes. None of Boston's reserves scored more than seven points. Torrey Craig led all reserves with 13 points. Seven Nuggets scored at least 11 points. Boston scored only 38 points in the paint. Well deserved 10 times over ... It was emotional, and it coulda lasted a lot longer ... I was glad that he got that moment..
Brad Stevens on Isaiah Thomas' tribute video. Hayward After Sweep of Pacers: 'It's Just the Beginning"